Simon was a simple Galilean, a brother of Jesus, as the ancients called one's close relatives  aunts, uncles, first cousins; he was one of the Saviour's four first cousins, with James the Less, Jude and Joseph, all sons of Mary, the wife of Alpheus, or Cleophas, either name being a derivative of the Aramaic Chalphai. The latter was the brother of Saint Joseph, according to tradition. All the sons of this family were raised at Nazareth near the Holy Family. (See the Gospel of Saint Matthew 13:53-58.) Simon, Jude and James were called by Our Lord to be Apostles, pillars of His Church, and Joseph the Just was His loyal disciple. Saint Simon the Zealot or the Zealous, was the name this Apostle bore among the twelve. He preached in Egypt, Mauritania (Spain), and Lybia, leaving behind him the fertile hills of Galilee, where he had been engaged in the healthful cultivation of the vineyards and olive gardens. 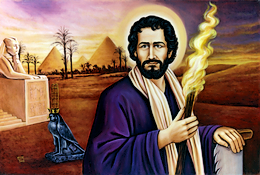 He later rejoined his brother, Saint Jude, in Persia, where they labored and died together. At first they were respected by the king, for they had manifested power over two ferocious tigers who had terrorized the land. 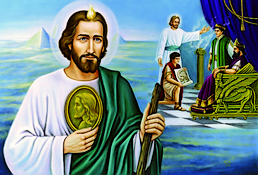 With the king, sixty thousand Persians became Christians, and churches rose over the ruins of the idolatrous temples. But the ancient enemy, who never sleeps, rose up, and when the two went elsewhere the pagans commanded them to sacrifice to the sun. Both Apostles, just before that time, had seen Our Lord amid His Angels. Simon said to Jude, One of the Angels said to me, I will take you out of the temple and bring the building down upon their heads. I answered him, Let it not be so; perhaps some of them will be converted. They prayed for mercy for the people and offered their lives to God. Saint Simon told the crowd that their gods were only demons, and ordered them to come out of the statues, which they did, revealing themselves under hideous forms. But the idolaters fell on the Apostles and massacred them, while they blessed God and prayed for their murderers. Saint Jude has left us a short but powerful epistle, written after the death of his brother James, bishop of Jerusalem, and addressed to the new Christians being tempted by false brethren and heretics. Reflection: Zeal is an ardent love which makes a man fearless in defense of God's honor, and earnest to make known the truth at all costs. If we desire to be children of the Saints, we must be zealous for the Faith. It is God who works in you both to will and to accomplish.